Thiruvanchikulam Temple in Thrissur, the cultural hub of Kerala, is a temple you can’t miss at Kerala, the green paradise! Acclaimed worldwide for its captivating landscapes, backwaters & beaches, Kerala is also known for its famous temples. Interesting legends and local history make each temple worth a visit! Lord Shiva is portrayed in various forms at the Thiruvanchikulam temple. The prime deity is Lord Shiva, as Mahadeva and his consort Goddess Parvati as Umadevi. Together considered as Uma Maheswara a form revealed to Sage Parasurama. As per local legends, the eminent Shaiva saint, Sundara Murthi Nayanar commenced his journey towards Kailash (Lord Shiva’s abode) from here mounted on a white elephant sent by Lord Shiva; Cheraman Perumal Nayanar escorted him on horseback. Idols of both are ensconced in the temple. 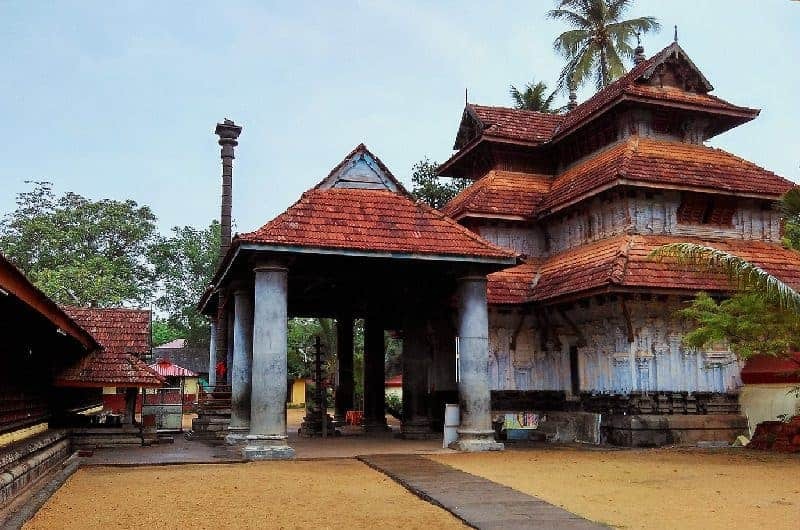 The Thiruvanchikulam Mahadeva Temple history dates back to more than 2000 years & it is believed to be constructed by a legendary Chera King, Cheraman Perumal. The oldest reference of the temple comes in the history of the ancient Tamil Sangam literature in a religious work Tevaram created by the Tamil saints, the Nayanmars. They listed the temple as one of the Paadal Patra Sthalam (a group of Shiva temples in the Tevaram). Incidentally, Lord Mahadeva is also the family deity of the Cochin Royal family who took up reign after the decline of the Chera rule. The Dutch and The Tipu Sultan of Mysore demolished the temple during their invasions. Later the Thiruvanchikulam Shiva Temple was renovated in 1801 AD. Typical Kerala temple architecture built according to the principles of Vastu Shastra can be seen at the Thiruvanchikulam Temple. One of the major attractions of this temple is the Namaskara Mandapam, with 16 pillars. The temple has an inspiring gateway decorated with carvings of elephants, gods, and goddesses. Magnificent ancient murals depicting Hindu mythology, Ramayana, stone & wood carvings and Salabhanjikas (sculptures) are a sight worth seeing for the art lovers. The main Deity is that of Uma Maheshwara represented by a Sivalingam in the form of a half circle just about 4 inches above the ground level. Due to this abridged form of Sivalingam said to be brought from the Chidambaram Rameshwara temple, one of the most popular Shiva temples in South India, the temple is reputed as Arathali temple. Thiruvanchikulam Mahadeva Temple has the most significant number of Upadevathas in Kerala as it is where Lord Shiva is believed to reside with his entire family. Along with Lord Shiva there are many other deities worshipped here like Sandhyavelakkal Sivan, Brangiradi, Palliyara Sivan, Bhagavathy, Sakthi Panchakshari, Goddess Parvathy, Lord Parameshwara, Prodhosha Nrithya, Sapthamathrukkal, Rishabham, Nandikeshan, Unni Thevar, Lord Ayyappan, Lord Hanuman, Nagaraja, Goddess Durga Bhagavathy, Lord Pashupathi, Nadakkal Sivan, Lord Subramanyan, Goddess Ganga, Konnakkal Siva, Kottarathil Thevar, Nagayakshi, Althara Gopudan Swamy, Dakshinamoorthy, Cheraman Perumal, Sundara Murthy Nayanar etc. The annual 10-day festival Vaisakapouranami Brahmotsavam celebrated in a grandly is a colorful festival not to be missed at the temple! The festival starts by hoisting Thiruvanchikulam Shiva Temple flag atop the Flagstaff (Dwajastambham) about 70 feet high. Aanayottam is held as a part of the festival. It marks the most renowned festival celebrated at Thiruvanchikulam Shiva Temple. A considerable number of devotees throng to the temple to seek Lord Shiva’s blessings on this auspicious day. Special poojas are also performed during the other Hindu festivals and on auspicious days. Pouring ‘Shanku’ flowers on the idol is the primary offering at the Thiruvanchikulam Shiva Temple. The offering is made by couples to overcome hurdles in marriage and fertility. The couple worships the Siva-Parvathy duo and leads them to the ‘Palliyara’ (their private bedroom). Palliyara Darshanam is believed to give marital bliss. The Temple opens for darshan at 5 am and closes at 11 am. The Palliyunarthal (waking up of the lord) is at 3.00 AM. Then the Lord and his Consort are escorted from the Palliyara to Mukhamandapa. Nirmalyam, Abhishekam (ablutions), and leading them to the Moolasthana, Usha pooja, Dhaara, Rudram, Pantheeradi pooja, Navakam, Panchagavyam, Uchapooja takes place & the temple remains closed for noon. At 5 pm the sanctum opens again. Nirmalyam followed by Abhishekam, Deeparaadhana, Athazha pooja & escorting the lord and consort to Palliyara takes place. Finally, after Palliyara pooja (Dampathi pooja) the temple closes at 8 pm. Stringent dress code exists for entering the temple. Men can only wear Mundu & Veshti, and boys can wear shorts. Women can wear Saris, skirts & Salwar Kameez. Thiruvanchikulam Temple is in Kodungallur, Thrissur District. By Air: The nearest airport is Nedumbassery International Airport 35 km away. By Rail: The nearest railway station is Iringalakuda, 16 km away. By Road: Well connected by KSRTC buses and private transport buses to Kochi (35 km), Thrissur (38 km) and Guruvayur (45 km). Tourist deluxe luxury buses ply from many cities including Chennai, Bangalore, Trivandrum, and Kozhikode to Kodungallur. A famous temple dedicated to Goddess Bhadrakali (an incarnation of Goddess Durga). The deity of the goddess Bhadrakali in the temple has eight hands with various attributes like the Sword, Asura head, anklet, bell, etc. The Bhagavathy Temple is also known as the abode of Kannaki, believed to be an incarnation of Kali. One of the oldest temples near Kodungallur at Edavilangu. Lord Shiva and Goddess Parvati posing together as Uma Maheshwara is one of the principal deities. The temple is also dedicated to Lord Krishna. Lord Ayyappa believed to be the son of Lord Vishnu as Mohini & Lord Shiva is the main deity here. Lord Ayyappa was also the foster son of King of Pandalam. 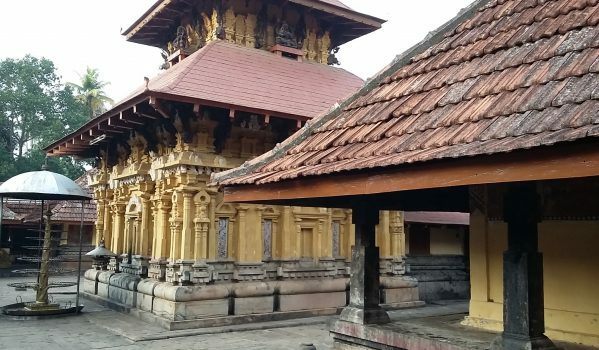 Now that you know more details about Thiruvanchikulam Temple which might have triggered your interest, if you are planning to visit the same do let us know. You can explore places around Thiruvanchikulam Temple in Trichur at your leisure. Don’t forget to customize your Kerala tour package with Blue Bird Travels for an incredible holiday experience. Previous postVadakkunnathan Temple – A Legacy in Heritage, Culture & History!